Time and again, Chancellor William B. Aycock ’37 (MA, ’48 JD) defined duty — for himself, for the University and for the people who sometimes questioned whether Carolina fell on the right side of history. No one was better suited to the task. It must have seemed to battalion commander William Brantley Aycock that the entire German army was headed straight his way — a feeling he shared with tens of thousands of Americans up and down the line. For the 10 days of the Battle of the Bulge, where life and death hung in the balance, Aycock was to demonstrate courage, tenacity, grit, determination and leadership. He was awarded the Silver Star for bravery in action. Years later, as chancellor of The University of North Carolina, he was to prove again and again that he would never give up in the face of challenge. The state’s legislators didn’t dare oppose the Speaker Ban Law that was dropped on UNC in 1963. But the chancellor did not feel so politically hamstrung. GAA President Doug Dibbert ’70 reflected in his “Yours at Carolina” column on Aycock’s life and legacy as the chancellor emeritus neared his 97th birthday in 2012. Aycock is installed as chancellor. In this famous speech about the Speaker Ban Law, Aycock picked apart the law’s ambiguities one by one. Time and again, former Chancellor William B. Aycock ’37 defined duty — for himself, for the University and for the people who sometimes questioned whether Carolina fell on the right side of history. No one was better suited to the task. 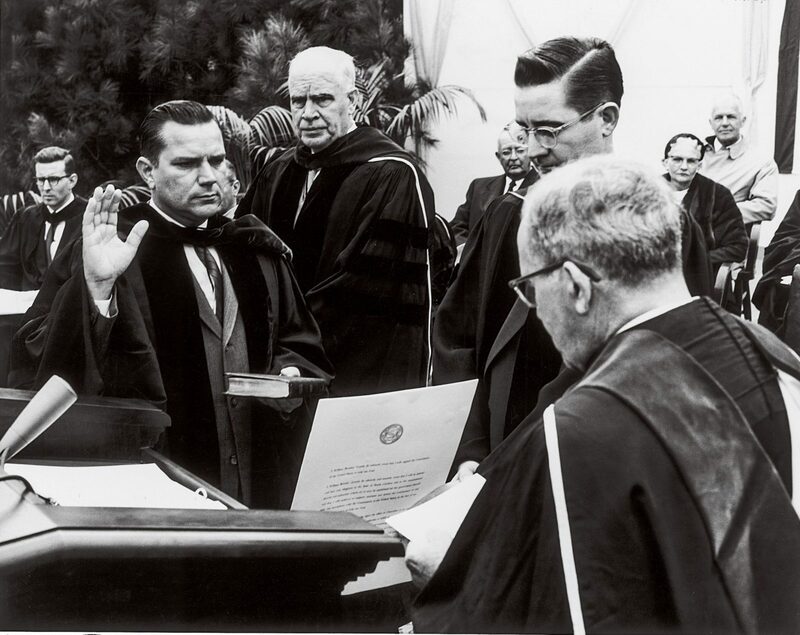 His turn as chancellor, from 1957 to 1964, established Aycock as a strategic guardian and often fiery champion of the University’s freedom and integrity at a time when threats to those underpinnings abounded.